Vans is the world’s number one skate shoe producer! The Californians have been making and selling vulcanized canvas shoes since 1966. Vans’ skate shoes quickly gained popularity, became a hallmark of the beaches of Orange County and eventually came to be associated with skateboarders worldwide. Vans Shoes: A Class of Their Own! Paul Van Doren was the founder of Vans. Over a period of 20 years, Van Doren went from being a janitor to having an office on the executive floor of Randy, which was the third largest shoe producer in America. The “Randy 720” was sold in 1965 as the world’s first skate sneaker. A year later, Paul, his brother Jim and their mutual friend Gordon Lee founded their own shoe company in Anaheim, CA: the Van Doren Rubber Company. Vans Shoes were made on location and sold directly in the Vans shop in Anaheim. In only 10 short weeks, Van Doren opened 10 more stores along the West Coast. Six months later, that number jumped to 50. 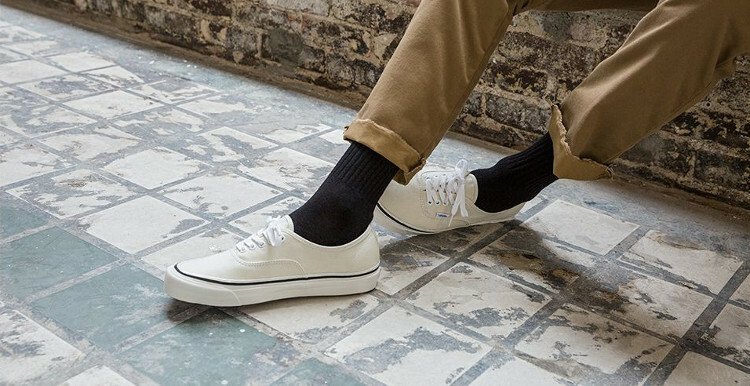 The most popular style at the time was the Model #44, which years later was renamed the Vans Authentic. Paul’s son Steve took over the company in the 70s. Around the same time, Vans shoes were being equipped with their signature waffle soles, which provide the wearer with excellent grip on their decks. Van Doren always had his ears and eyes open and knew what was destined to become popular. That’s why he enlisted Tony Alva and Stacy Peralta, two skateboarding legends, to help out with his company. They began development together on the so-called Off the Wall Vans shoes such as the Vans Era (1975/1976), the Vans Skate Hi (1976) and the Vans Old Skool (1976/77). They were “off the wall” because Alva and his crew used to skate vertically “off the walls” of empty pools with their skateboards. The Vans Slip On was the next big thing in the 80s, partially thanks to the cult movie Fast Times at Ridgemont High. Sean Penn wore the checkerboard version in the movie and instantly created a trend. Another popular model at the time was a pro shoe from Steve Caballero: the Half Cab, which came out in 1992. At the end of the 80s, Caballero got his first signature shoe with Vans: the Caballero High Top, making him the second skater ever to get a pro shoe model (after Natas Kaupas for Etnies). At the beginning of the 90s, skaters were cutting the Cab down to the ankle and sticking duct tape on the edges in order to allow for more freedom of movement, particularly at the ankles. In 1992, Caballero’s second pro model came out: the appropriately named Vans Half Cab. Even decades after their release, the Half Cabs are still going strong and are the longest-running signature skate shoes of all time. Skateboarders like John Cardiel, Geoff Rowley and Jason Dill are carrying the Vans torch and continuing to ensure that Vans is number one in skateboarding! Besides shoes you can also find clothes, accessories and backpacks from vans in our online shop.